Published: Jun 7, 2016 · Modified: Apr 12, 2019 · By Jen Sobjack · This post may contain affiliate links. 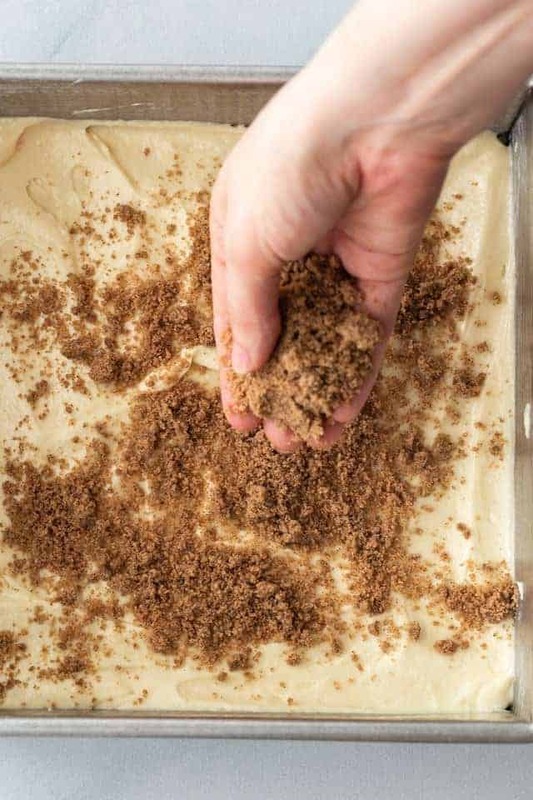 With a thick cinnamon streusel topping over fluffy, buttery cake and a ribbon of melty cinnamon through the center, this Cinnamon Crumb Coffee Cake is going to be a hit at your family breakfast. 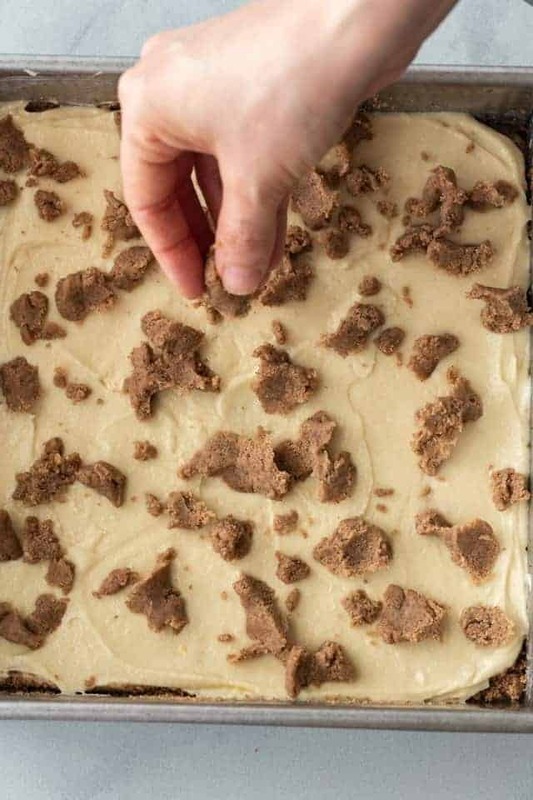 This classic coffee cake recipe is from Jacqueline at Go Go Go Gourmet, a food blog dedicated to busy moms who enjoy baking, cooking, and entertaining. 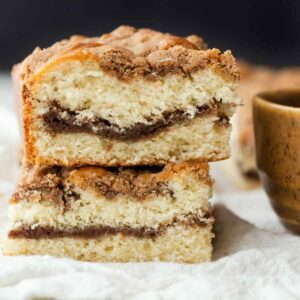 The coffee cake is buttery, light, fluffy, and features a sweet ribbon of melty cinnamon through the center. It’s everything a good breakfast cake should be. And it’s piled high with a thick cinnamon streusel topping that offers a lovely texture contrast. It’s similar to my cinnamon sour cream coffee cake except this one is butter based. It’s so buttery tender, it practically melts in your mouth! Perfect for enjoying alongside a cup of hot coffee. Truly the best crumb cake recipe. Sweet carbs are actually one of the things I really enjoy for breakfast. If you are like me, you may also want to try these whole wheat banana muffins and peanut butter and banana coffee cake! Every baker should have this easy crumb cake recipe on hand. 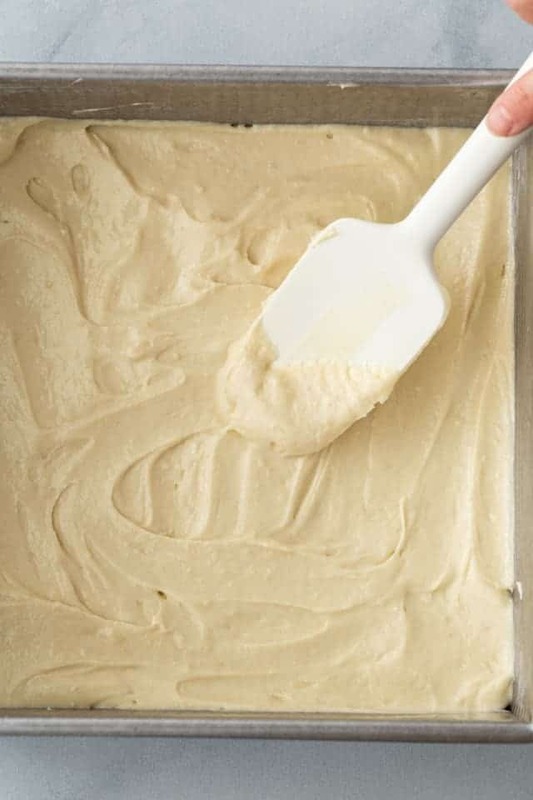 The batter is thick and ultra rich. It yields a super soft crumb which is perfect for a cake that you are going to eat for breakfast. Butter and an egg leave the cake fluffy and tender with tight crumbs throughout. The butter is creamed with the sugar which provides the moist, cakey texture that is so well loved about this coffee cake. There’s a ribbon of sweet cinnamon through the center of the cake and thick crunchy cinnamon streusel over the top. Both the filling and topping are made with brown sugar, flour, cinnamon, and softened butter. 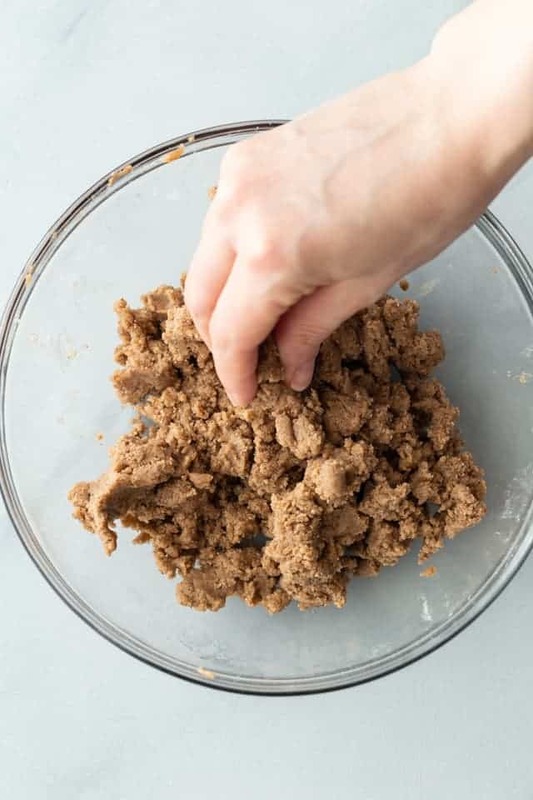 Work the softened butter into the dry ingredients with your fingertips or a pastry cutter until the mixture resembles coarse crumbs. It’s important to use softened butter in this recipe. 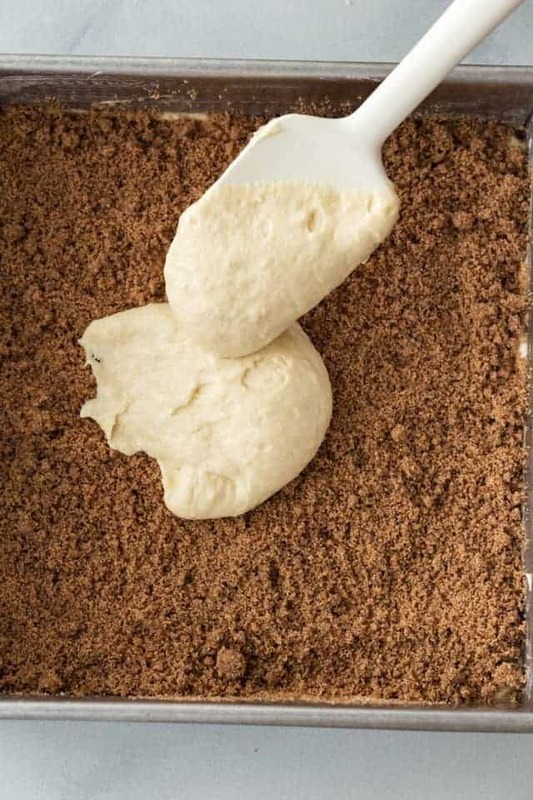 Softened butter is easier to work into the dry ingredients, making sure each granule of sugar, flour, and cinnamon are coated with buttery goodness. 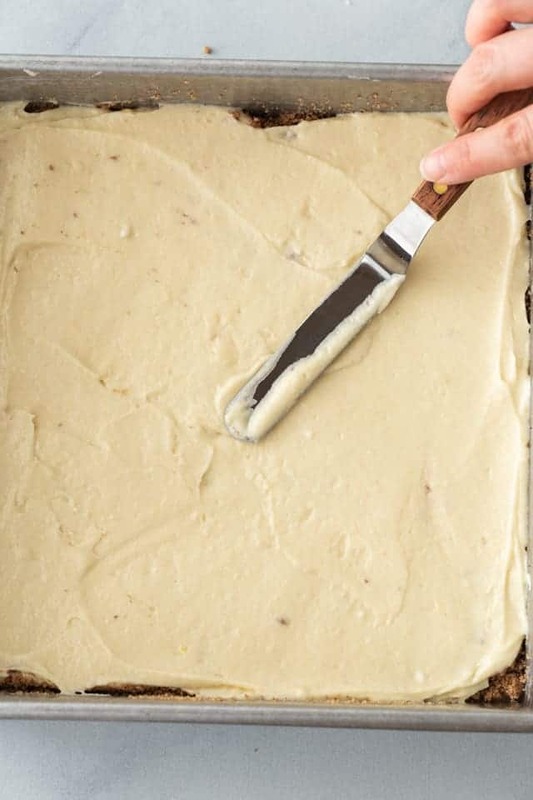 Prepare the batter and spread half in the bottom of a 9-inch square cake pan. Prepare the filling and sprinkle it over the batter in the pan then top the filling with the remaining batter. 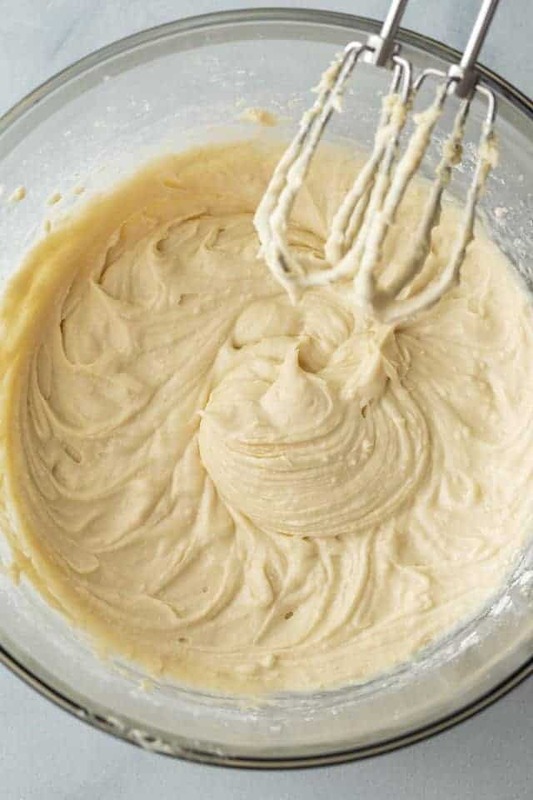 Make the topping and sprinkle it evenly over the top of the batter. 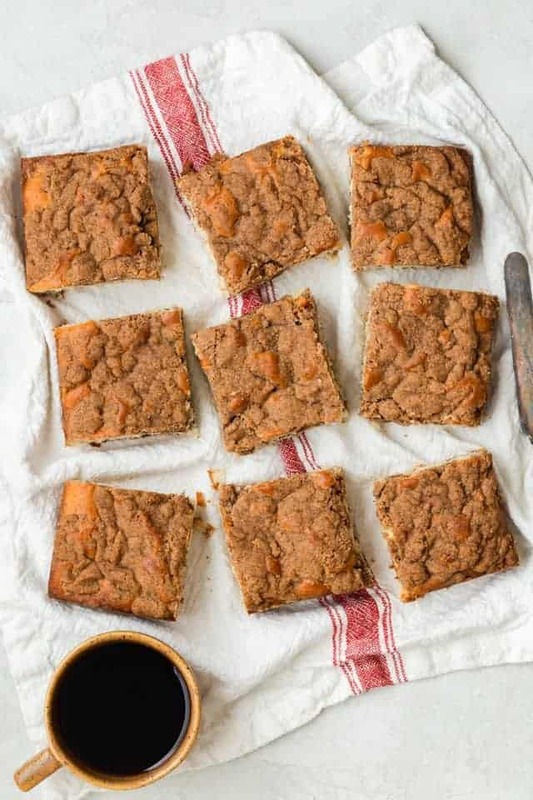 Bake the coffee cake for 45-50 minutes in a 350°F oven. Can you make it the night before and then bake it in the morning? I’d recommend baking it the night before. Let it cool completely and store it in the refrigerator. You can warm it the next morning by baking it at 300°F for 15 minutes. Is the cinnamon crumb topping very sweet? I don’t think it’s too sweet. The cake overall is well balanced. But everyone’s taste is different. I suppose you could. They would turn out more like a muffin than a cupcake though. This recipe is from Go Go Go Gourmet. Please visit her site for full instructions. Sounds wonderful. Having 18 for breakfast the day after Christmas and would like to know if I can make it in a 9×12 dish. How would that change the recipe and the cook time? Hi Pat! I have only made the recipe as directed by Go Go Go Gourmet. Since it’s her recipe, she’d probably know how to modify it better than I would. Have you tried making it in a bundt pan? Is it okay to leave the substitute the unsalted butter for regular butter and not add the salt? Hi Nicole! I don’t ever recommend using salted butter since there is no way to know how much salt is in it. Every brand is different and the cake could come out too salty. It’s really up to you if you want to chance it. Made this with diced walnuts mixed in to the filling and topping. Also used buttermilk instead of regular milk. Bomb dot com 🙂 Great recipe! Anybody try making cupcakes with this recipe? I am guessing at the temperature now. Sid i miss it somewhere? Is 375* the magic number? There’s a link in the recipe for you to click to see the full instructions on Go Go Go Gourmet‘s website. It’s not my recipe so I didn’t list everything in full. Thank you…I did find the gogogo link. *350 was the magic number :-). It turned out well…a little dense though. I am going to add more milk this time. Your thoughts? I didn’t experience this when I made her cake. I thought it was exactly the way coffee cake should be. Maybe you used too much flour. Try measuring it with the spoon and level method. I have a post explaining why this method is best: How to Measure Flour. Website doesn’t work! I would love to try this, is there any way you can post instructions too? Please! And thank you! I’m sorry you couldn’t get to the recipe. I assure you she was working hard to get the situation resolved and her site is back up. If I did post the entire recipe, there would be no reason for you to go to her site for her own recipe. That simply wouldn’t be fair to her! I’m sorry you couldn’t get to the recipe. Sometimes these things happen but I assure you she is working to get the situation resolved. I will never post the entire recipe on my site because it isn’t my recipe. If I did post the entire recipe, there would be no reason for anyone to go to her site for her own recipe. That simply wouldn’t be fair to her! Tried and true coffe cake recipe!!! Absolutely delicious!! !👍 Thank you. 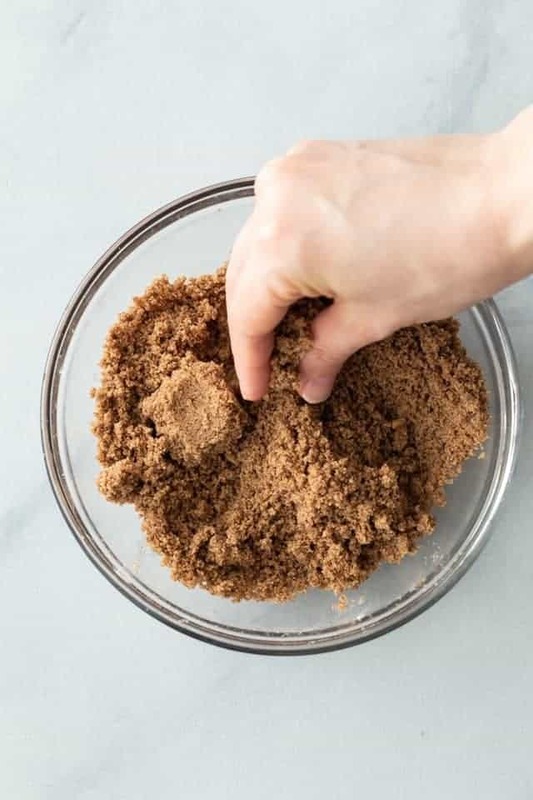 Is the cinnamon crumb topping very sweet? I’ve made a different recipe before but the topping was way too sweet to eat. Looks good though! Been trying tonight to send the recipe to my e-mail. No success. So glad you shared this one Jen! I’m a HUGE coffee cake fan! Can’t wait to try! This looks like the ULTIMATE coffee cake! I’m loving all that crumble 😀 my favorite part! The cinnamon swirl in the middle looks swoooon worthy. The crumble on this coffee cake looks AMAZING! I love cinnamon, and this definitely looks like it has big cinnamon flavor. I need this with my coffee tomorrow! I’m drooling by just looking at these gorgeous photos! This cake looks awesome! Will definitely try it! This looks like the BEST coffee cake! Love the cinnamon center and that thick streusel! I am definitely going to have to check it out. 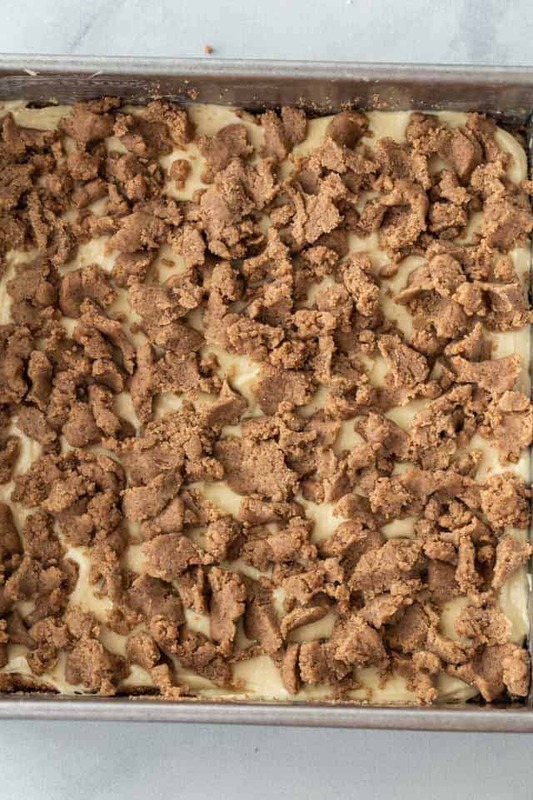 This coffee cake looks so amazing, Jen! I love that sky high crumb topping and the ribbon in the middle is just perfect! Heading over to check out the recipe! I love all crumb desserts, they are so good! This looks like the perfect coffee cake, going to check out the recipe on Jacqueline’s blog! 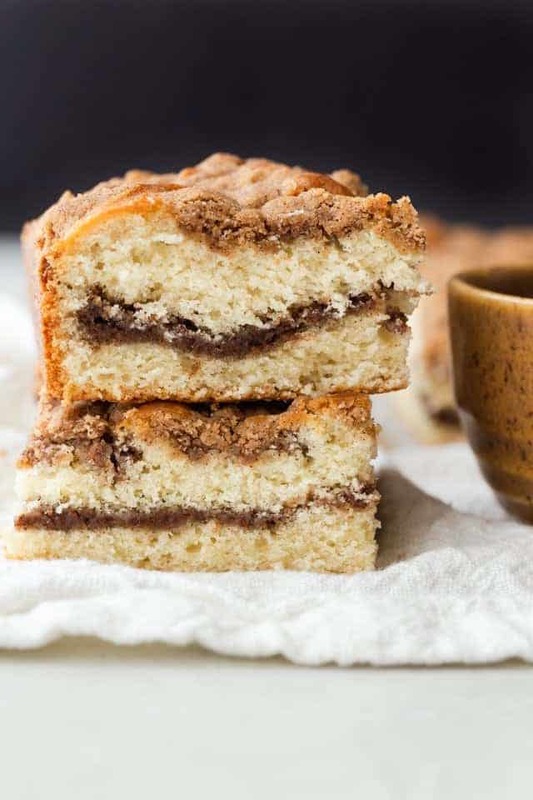 I would love to start my day with a slice of this coffee cake and a big mug of coffee! I really wish this had been my breakfast this morning. It’s putting my toast to shame! 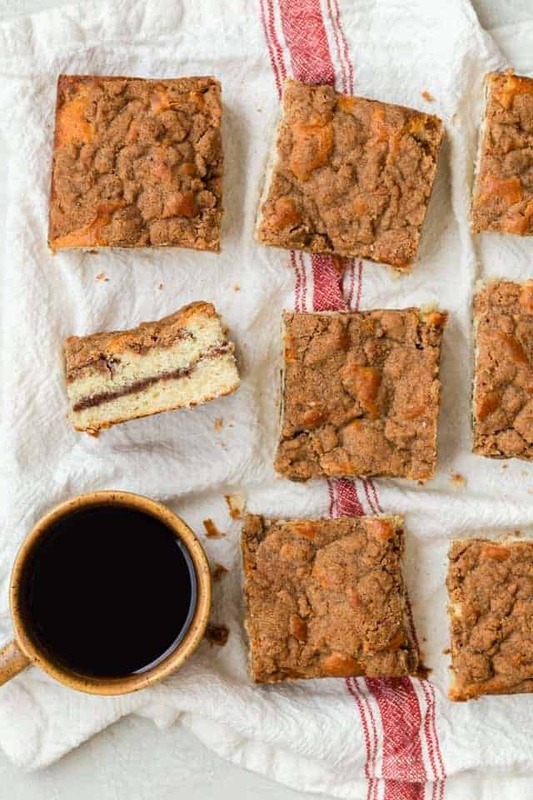 There’s nothing like coffee cake and a cup of coffee. That crumble topping is calling to me! 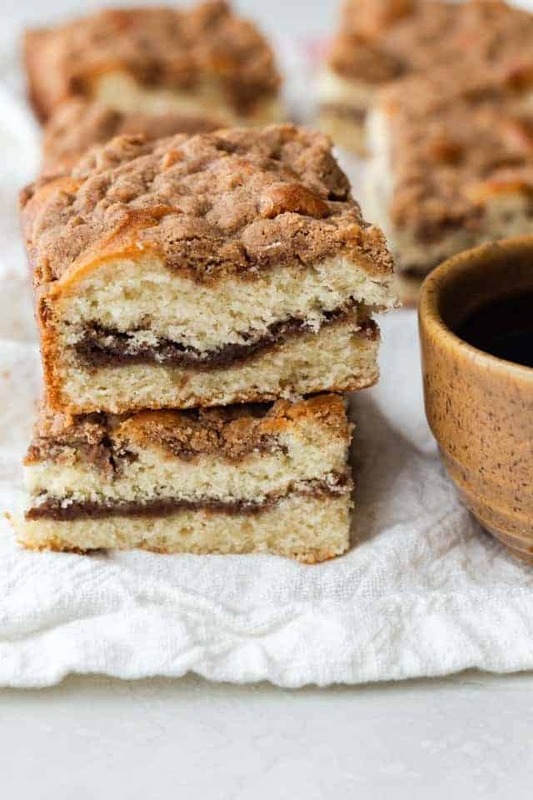 I think that if I could only pick one breakfast treat to have FOREVER, a cinnamon crumb coffee cake like this would be IT. Such a favorite, and your version looks absolutely perfect! This coffee cake is absolutely STUNNING, Jen!! I seriously love every single part about it. It looks so moist, that crumb topping is perfection, and that ribbon in the middle is making me DROOL. I need a slice asap!! This coffee cake is definitely perfect to enjoy warm from the oven and with a hot cup of coffee! I love the cinnamon flavor! Such a classic and delicious treat. Heading over to check out the recipe!